I hope you’re all enjoying your summer. I’ve been busy, which is why I haven’t been over here sharing awesome vegan stuff. I hope you’ve all taken advantage of my Resources page in the meantime. There are lots of things I’d love to share, but the first thing that came to mind was a lunch date the hubby and I had with our bestest buddy Jerry (See Jerry here and here). A new restaurant has opened in San Antonio and guess what? It’s 100% Vegan. Shocking? Yes, I know. I have to admit that I wasn’t as excited as I should be. What if they got it wrong? What if the food was just terrible and everyone who went there said “Oh, Vegan food is disgusting, I’ll never ever try ‘vegan’ food again!”. Okay, I’m being a bit dramatic, but I was really worried. Maybe I have trust issues, but I take my veganism personally, so it would pain me to see a Restaurant that I should love, fail. Luckily, they didn’t fail. We visited on a busy Tuesday afternoon a couple of weeks after they had opened. There was hardly an empty table to be seen, which was encouraging. The place is small and welcoming with a lovely counter and dessert display case. We got a large table in a middle room between the restaurant and the book store it’s connected to. The staff was friendly, despite looking a bit overwhelmed. I overheard women talking about what they enjoyed and how they had already tried several of the menu options, and there are plenty of options. I ordered Nachos as an appetizer and was surprised by its enormity. They were delicious, but next time we’ll have to politely ask for them to be a bit warmer. Jerry ordered the Flautas, but he didn’t seem to like them too much. We talk about it and agreed that Mexican restaurants with accidentally vegan food is often better tasting than Mexican dishes at Vegan restaurants. Maybe it’s a compensation kind of deal. I know I don’t eat cheese, but I really don’t need fake cheese all over my food. It photographs well, but sometimes the taste is just a little off or the favors don’t come together. As much as I like the idea of coconut cilantro rice, maybe already vegan-friendly Spanish rice makes more sense. Mark is less picky than Jerry and liked the Lunch Special he ordered. 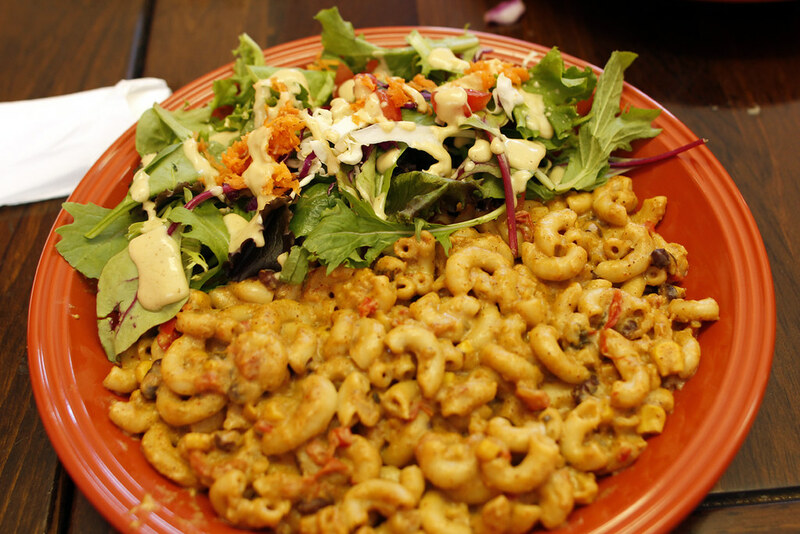 There were some serious proportion issues when comparing the amount of Macaroni to the dessert (see below). He barely got through half of this plate, but we did take down a “Mountain of Nachos” right before. 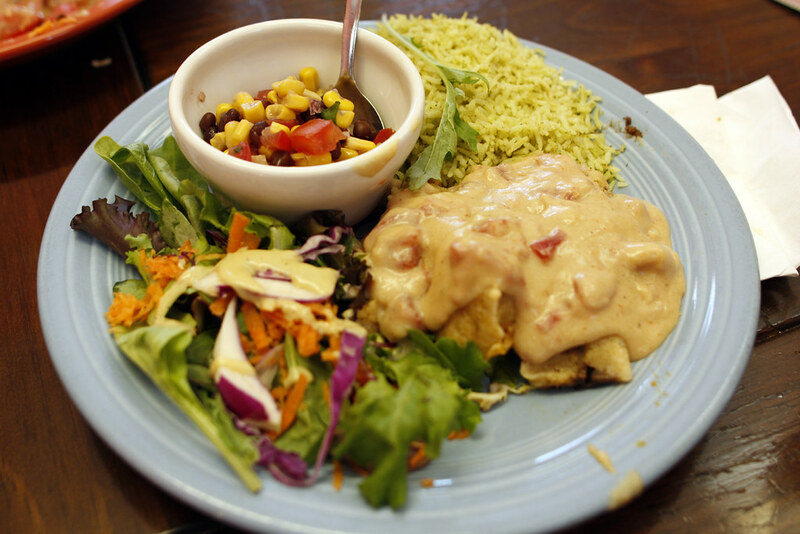 I enjoyed by Tamale plate, but I wish they had warned me my tamales would be covered with a vegan cheese sauce. I have never heard of tamales covered in cheese sauce, but now I know. The tamales were small, but delicious. I didn’t care for my cilantro rice (the best part of a mexican restaurant is their Spanish rice!) or my corn and bean salad. I love me a good corn and bean salad, but there was a strange flavor I didn’t expect. The best corn and bean salads are the simplest. Corn, beans, fresh cilantro, fresh tomatoes, fresh onion, done. 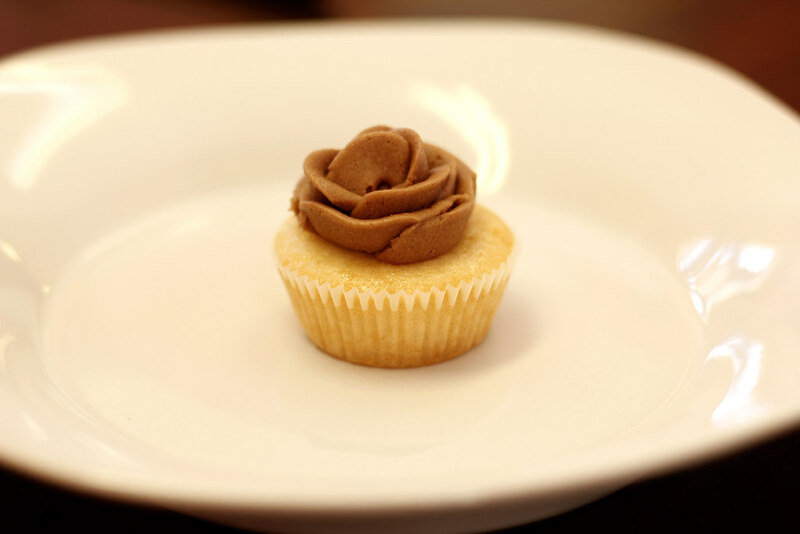 Here is the tiny cupcake Mark got with his Lunch Special. We cut it in threes to taste. I thought it was actually a perfect portion, and very tasty. If only the plate had better proportions so it didn’t make the cupcake on a giant plant seem silly. When we left I didn’t know what to say. Yes, I was wrong, Vegeria has some great food, but I was still a bit worried. I want the very best for Vegeria with all their good intentions. There is still so much food left to try, their Tofu Egg Salad Sandwich, Peanut Butter and Jelly Club and Broccoli and Queso Nachos sounds good to me. We’ll definitely go there again, and I encourage you to try it also. 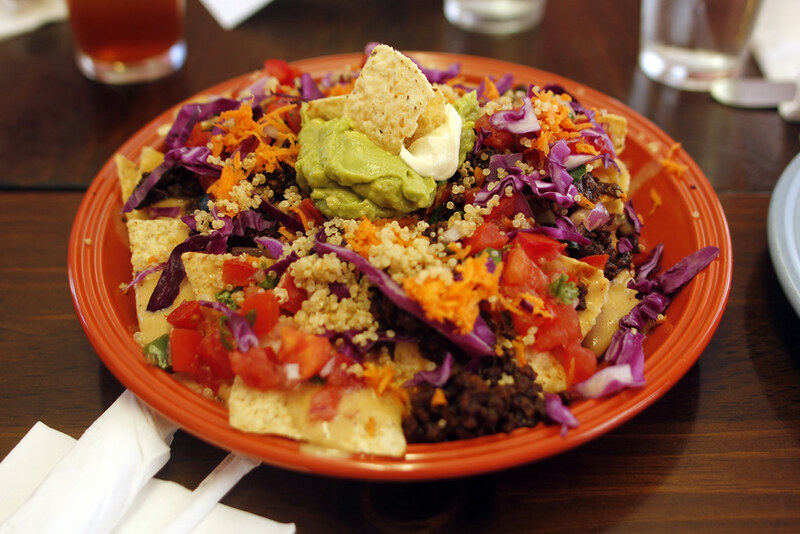 Support your local Vegan community and the only all-vegan restaurant we got! I want someone else to walk in there and say “Hey, vegan food really does have a market in San Antonio”, then BAM, new vegan restaurant. I would be that person, but alas, filmmaking calls my name just a little louder. This entry was posted in Local Restaurant Reviews and tagged Mexican, San Antonio, Vegan. Bookmark the permalink. 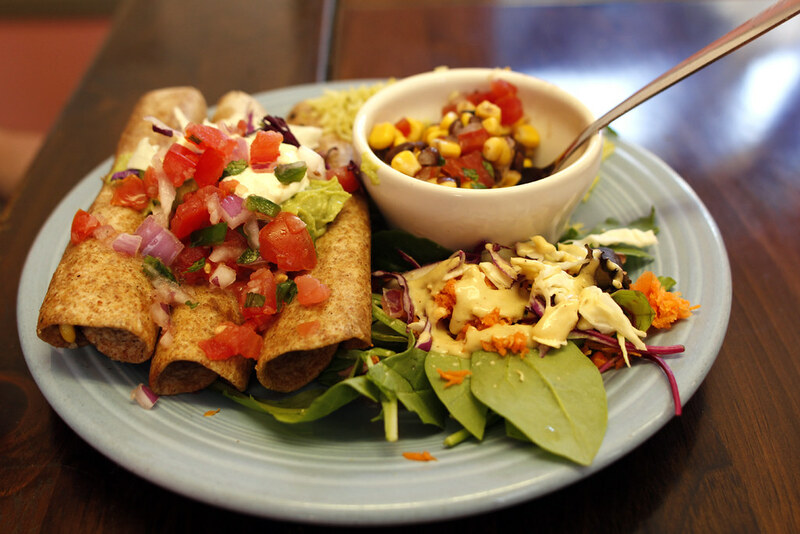 A good vegan tamale can be hard to find, so I’m glad they seem to have figured it out! We’ll have to try the Portabello Sub next time, thanks!